Al Pittman - photo courtesy of Breakwater Books, Ltd.
Al Pittman was born in St. Leonard’s, Placentia Bay in Newfoundland, on April 11, 1940. He grew up in Corner Brook NF, eventually moving to Montreal in 1964. Pittman next moved to Fredericton, NB in 1968, where he attended St. Thomas University until 1970. Pittman moved back to Newfoundland in 1972, and in 1973 he co-founded Newfoundland’s first publishing house, Breakwater Books, along with some fellow colleagues. Pittman became acquainted with many other writers during his life, such as Raymond Fraser, with whom he edited the literary magazine Contemporary Canadian Writing while in Montreal. Pittman was a very accomplished Canadian poet and writer, having had a career that survived well past his death. He has dipped his toes in many literary genres, writing multiple books of poetry, children’s books, plays, and short stories, as well as working for magazines, radio, and television. His work earned him many awards, including the Borestone Mountain Poetry Award, The Canada Council of Arts Award, and The Writer’s Alliance Book Award for Poetry, as well as being inducted into the Arts Council’s Hall of Honour (1999). His first collection of poems, The Elusive Resurrection (Brunswick Press, 1966), was followed by Seaweed and Rosaries (Poverty Press, 1968), a play titled A Rope Against the Sun (Breakwater Books, 1974), and a book of children’s fiction, Down by Jim Long’s Stage (Breakwater Books, 1976). 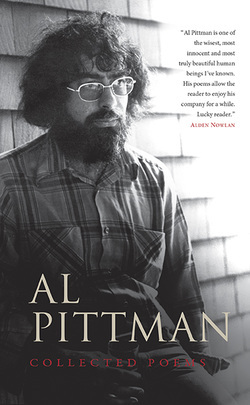 Pittman’s work extends beyond the mentioned titles and continues to be published today, such as Breakwater Books’ 2015 release of Al Pittman: Collected Poetry. ​In addition to his literary and academic work, Pittman co-founded ‘March Hare,’ an annual poetry and music festival which is Atlantic Canada’s largest festival of the genre. Until his death in 2001, Pittman was the Writer in Residence at Sir Wilfred Grenfell College in Corner Brook. Poem: "The Dance of the Mayflies"
dance their dance and die. in the shallow altitudes of the air. copulation in the summer sun. of beauty or emblems of ecstasy. to dance one dance and die. and always one more dance. Published in An Island in the Sky: Selected Poetry of Al Pitman (Breakwater Books Ltd., 2003). “The Dance of the Mayflies” demonstrates Al Pittman’s constant observation of the human life and his recognition of the minutest detail. Pittman achieves this circumspection by exploring the contrasting concepts of the familiar and unfamiliar by finding the positive in each and ultimately challenging readers to embrace the life they are given and to find purpose in all they do. Pittman begins his poem by equating human existence to something small and grossly underrated: the life of a mayfly. Although these little creatures live a completely different life than humans, as “[t]hey are insects who are born/to dance one dance and die,” they are still able to teach a valuable lesson. The “destinies” of the mayflies are known, as explained by the previous quote (17). But with no control over their short life, the mayflies do not have the opportunity to make an impact on anyone’s life while they live: “But they aren’t odes or rhymes/on wings. They aren’t symbols/of beauty or emblems of ecstasy” (12-14). Essentially, the mayflies do not appear to have much to offer and go highly unnoticed by the pre-occupied humans around them. But, Pittman still has a purpose for these insects, which he reveals through the continued contradiction of the familiar and unfamiliar. Before exposing the purpose of the mayflies, Pittman begins his ambiguity by bringing two common human thoughts together: “We who have known/and yet long for lasting love” (1-2). While caught between the concepts of “know[ing]” and “long[ing],” humans find themselves in a space where they are unable to attain the contentedness of the mayfly, which Pittman suggests contains a love so great that the insects are willing to “dance their dance and die,” as should humans (5). Pittman goes on to characterize the flies as having a sole purpose – to dance – and explains that although their life is limited and unpredictable, they live it to the fullest. Unlike the mayfly, the human life spans many years. Within this life, we do not dance just one dance and then die; instead, the outcome of our lives is unknown, and the number of dances in which we partake cannot be estimated; it is exactly this type of unknown which Pittman suggests we embrace and put to good use. Pittman asserts the contrast between human and insect by stating “our destinies/are less defined than theirs” (17-18). Although the mayflies have one short life to live, and although it would seem that Pittman presents a poem urging readers to embrace each day and live it to the fullest, the poet actually counters the assumed belief of seizing the day by questioning the human desire to “know there’ll always be/a morning after and always/another night to stumble” (19-21). Unlike the life of the mayflies, Pittman suggests that humans have multiple lives to live and countless years to figure out the best way to live. Therefore, we need to learn from our mistakes and move on, and embrace whatever each day gives. and over, for the next… (24-29). Instead of preparing for the one death we will all face, Pittman challenges the desire to live (the known) by proposing a continual death, or a constant state of unknown. In this unknown, mortality, one of the greatest fears amongst humans, will be likewise contradicted with a love that continues “day after day, night after night” because of the firm acceptance of our everyday, individually made purpose (27). With a continual contradiction of the familiar and unfamiliar, Pittman urges readers to learn from the mayflies and realize that there is “always one more dance” (30). For, despite our desire for a concrete, unchangeable familiar, it is sometimes in the surrender of one’s self where a greater purpose is understood. Pittman, Al. “Dance of the Mayflies.” An Island in the Sky: Selected Poetry of Al Pittman. Ed. Martin Ware & Stephanie McKenzie. St. John’s: Breakwater Books Ltd., 2003. Print. Pittman, Al. Al Pittman: Collected Poetry. St. John’s: Breakwater Books, 2015. Print. ---. An Island in the Sky: Selected Poetry of Al Pittman. Eds. Martin Ware and Stephanie McKenzie. St. John’s: Breakwater Books, 2003. Print. ---. Dancing in Limbo. St. John’s: Breakwater Books, 1993. Print. ---. Once When I Was Drowning. St. John’s: Breakwater Books, 1978. Print. ---. Seaweed and Rosaries. Poverty Press, 1968. Print. ---. The Breakwater Book of Contemporary Newfoundland Poetry. Eds. Ken Babstock and Michael Crummey. St. John’s: Breakwater Books, 2013. Print. ---. The Elusive Resurrection. Fredericton: Brunswick Press, 1966. Print. ---. Thirty for Sixty. St. John’s: Breakwater Books, 1999.Print. ---. Through One More Window. St. John’s: Breakwater Books, 1974. Print. Pittman, Al & Tom Dawe. Island Poems. SCL 7.2 (1982). Web. 27 Jan. 2016. Pittman, Al. A Rope Against The Sun. St. John’s: Breakwater Books, 1974. Print. ---. West Moon. St. John’s: Breakwater Books, 1995. Print. Pittman, Al. The Boughwolfen and Other Stories. St. John’s: Breakwater Books, 1984. Print. ​Pittman, Al. Down by Jim Long’s Stage. St. John’s: Breakwater Books, 1976. Print. ---. One Wonderful Fine Day for a Sculpin Named Sam. St. John’s: Breakwater Books, 1987. Print. ---. On a Wing with a Fish. St. John’s: Breakwater Books, 1992. Print. Glaap, Albert-Reiner. "Back To The Future: Al Pittman, A Rope Against The Sun - A Slice Of Canadiana." Anglistik & Englischunterricht 33 (1987): 55-65. MLA International Bibliography. Web. 18 Feb. 2016. Goldie, Terry. "Al Pittman And Tom Dawe: Island Poems." Studies In Canadian Literature/Etudes En Litterature Canadienne 7.2 (1982): 200-213. MLA International Bibliography. Web. 18 Feb. 2016. Warner, Patrick. An island in the sky: selected poetry of Al Pittman. Books in Canada 33,7 (2004): 36. Web. 18 Feb. 2016.